The eclipsed moon engulfs the words of a sacred promise in this post-modern piece. The celestial inspired ketubah cleverly blends two contrasting cosmic images into one as stripes centered around the silent queen of the night and tides. Earth’s oldest companion has always stayed by its side, shining it with light to drive out the darkness whenever it is around. The twinkling stars, planets and galaxies subtly weaved into the background of the ketubah speak of unfamiliar territories waiting to be explored. This ketubah is perfect for couples who draw strength from each other; the couples who rely on each other in the dark times, as well as, the good. Like the moon, these couples never stray too far from each other’s side, attracted to each other by a force stronger than gravity. They silently watch guard over one another, forever forged in a bond steeped in balance and stability. 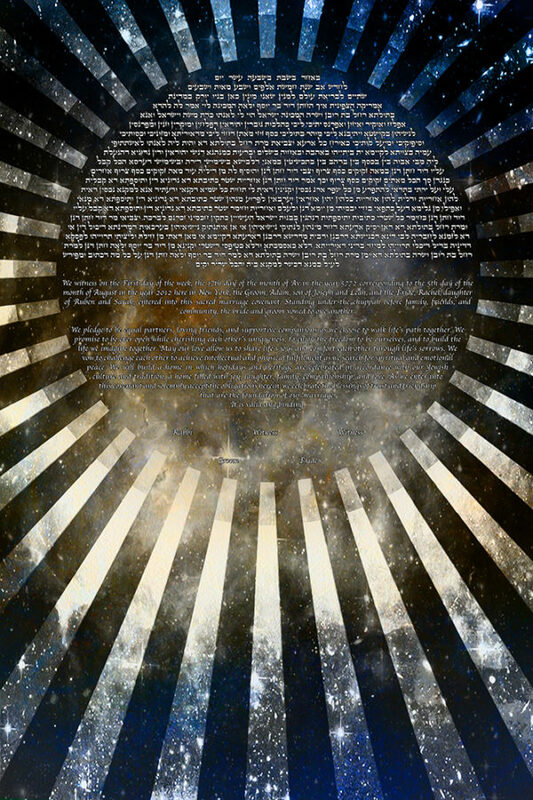 The Under the Eclipsed Moon Ketubah is part of the Under the Moon Series of Ketubah. Please see the series page to see the same ketubah in different colours.